When redesigning a WordPress Blog website, people often run into some issues related to optimizing the site for search engines. One of those issues was the title tag. The default title that comes with WordPress will likely leave a lot of pages in Google’s supplemental results because the name of the blog appears at the beginning of each title on every page. By default, the blog name appears first then some funny arrow and lastly the name of the post, category or page. The most important information appears last. For your article posts, you want to name the post using its title. Having the name of the blog at the end of the title on post pages isn’t going to improve search rankings and could put some of our pages in the supplemental results. Another easy solution to the title tag problem is to use the All in One SEO Pack WordPress Plugin which allows you to create a unique title tag, meta description, and meta keywords. If you decide to use All In One SEO Pack, make sure that you don’t have meta description and keyword tags already in your header.php file. This will cause your pages to have two sets of meta description and keyword tags. Also, make sure that <?php wp_head(); ?> is placed somewhere between the <head> and </head> tags to ensure that the meta description and keyword tags show up. After the title tag, the H1 tag is the most valuable on-page asset in influencing the search engines. Most WordPress themes have the same H1 tag on every page of the site because there is one header.php file that is used for each page. In this header.php file the name of the blog is surrounded by H1 tags. That will work great for the home page, but not for every other page on the site. For all other pages, we will want to put the title of the page in the H1 tag. To accomplish this we will need to create two separate header.php files. One for the home page and one for all the other pages on the site. Duplicate the original header.php file and rename it header-home.php and reference it only from your index.php file. In most cases, the H1 tag should include the title of your blog and any important keywords. 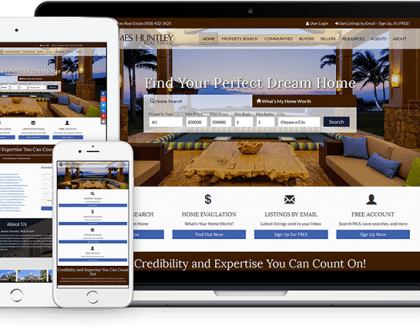 For your Real Estate Agency’s Blog page, you can name it as “Real Estate Blog – Internet Marketing News, Tips and Insights” in the H1 tag for the home page. Note: Instead of creating a second header file, you can copy the contents of your header.php file and replace the <?php get_header(); ?> in the index.php file. On the home page and category pages we want the title of each blog post surrounded by H2 tags. This is the default setting for most WordPress themes. For individual posts you can use H2 tags to highlight subtitles in the copy. These are fairly easy changes to make in the code of your pages. The header tags in most WordPress blogs are used improperly because of the one header issue. Correct this issue and you may see an increase in search traffic to your blog. Since the filename of a page is an important factor in search engine algorithms it is important that we name our pages appropriately. Ideally, we want the main keywords of our post title separated by dashes. For example, a good name for this page would be ‘blog-file-names’ or ‘opinions/file-names.’ By default, WordPress uses filenames that have question marks and lots of numbers in them. This is not good. WordPress does allow us to create custom URL structures that are more search friendly. In your WordPress administrative panel click on Options and then Permalinks. Under Common options select Custom. Here we can tell WordPress how we want our filenames to look. This will give us the domain name followed by the category followed by the name of the post with the words separated by dashes for a filename. This is a lot better naming structure than the default, but we can still do better. The Post Slug panel on the post editing screen allows us to create a custom filename for our post. A dash is put between each word we put in the Post Slug and used as our filename. For this article, I put ‘WordPress filenames’ in the Post Slug. Changing the permalink structure for existing blogs will cause the filenames of all your posts to change. This can hurt you in the search engines more than what you gain by having a search friendly filename. I recommend starting with the custom permalinks on new blogs only. If your permalink structure is set to the default, you can use the Post Slug to make future filenames search friendly. Besides making our filenames search friendly the custom permalink and Post Slug features can improve the aesthetics, usability, and forward-compatibility of our links. Even though the meta description tag is less relevant for influencing search results than it was a few years back, it can still play an important role in bringing traffic to your site. Most search engines put the first 190 characters of your meta description tag below the linked title of your page in their search results. If written in a compelling manner, combined with your title tag it may draw searchers into your site. If a page doesn’t have a meta description, the search engines will list the text that it finds near the top of the page for a description. By default, meta descriptions are not included in WordPress, but can be manually included by editing the header.php file. Now that we are able to add meta tags to our template, we’ll need a way to dynamically add unique keywords and descriptions to each post. To add a description and other meta tags that are unique we will have to use plugins. There are a number of plugins that allow bloggers to set the description, keywords and other meta tags to be unique in each post by using the Custom Fields in the Write Post Panel. You can find a list of these here. Again, we use All in One SEO Pack which allows you to create a unique meta description and meta keywords. It also lets you create a title tag this is different than the title of your post, which comes in handy sometimes. If you decide to use All In One SEO Pack, make sure that you don’t have meta description and keyword tags already in your header.php file. This will cause your pages to have two sets of meta description and keyword tags. Also, make sure that <?php wp_head(); ?> is placed somewhere between the <head> and </head> tags to ensure that the meta description and keyword tags show up. What’s Wrong With Duplicate Content? When search engine bots see duplicate content, they try to determine the original source so that they can choose which version to display in the search results. Duplicate content is often associated with content theft, spamming, splogging (an example of splog: http://howtoblog.cc/?p=254) and other SEO bad practices, so it is possible that a site or pages within a site can be penalized. Pages that have duplicate content in the form of excerpts are rarely a problem for the search engines. See this SEOmoz post for the full story on duplicate content. Duplicate content is an issue for many WordPress blogs because it is possible that the content from your post page is also on the front page, archive page for the day it was written, the month it was written in, the year it was written in and each category archive page under which it was filed. It is very possible to have the same content on at least six pages of a WordPress blog. This can confuse the search engine bots when they are trying to decide the original source. There are many plugins that solve the duplicate content problem by putting <meta name=”robots” content=”noindex,follow”> in the header of all archive and category pages. This causes the search engine robots to not index those pages. The problem with this method is that it is still possible to have the same content on the front page and the post page. Another negative is that a site will have much fewer pages indexed by the search engines, resulting in less internal links to your posts. Since the search engines are less likely to penalize a page for having a small chunk of content that is also found on another page of the site, it is best to display an excerpt from the post instead of the entire post. You could even go one step further and write an excerpt that is original. Using the more quicktag, which can be found above the editing window in your Post SubPanel is one way to create an excerpt for a post. The content above the more quicktag will be displayed as an excerpt on the front page, archives, categories, and in searches. Only the content above the more quicktag will be shown in RSS feeds. This can be a problem because many people don’t like partial RSS feeds and will unsubscribe. <?php the_excerpt(); ?><p>Continue Reading: <a href=”<?php the_permalink(); ?>”><?php the_title(); ?></a></p> in your index.php, archive.php and search.php pages. Not only does this solution eliminate duplicate content and give a full RSS feed, it also provides a search friendly link because the anchor text on the read more link is the title of the post. There are WordPress plugins that allow you to modify the default number of posts displayed by the WordPress loop before it creates a new page. By default, the number of posts displayed by the WordPress loop before it creates a new page is the same for all pages that list multiple posts. (ie. home page, category pages, search page) This can have a negative effect on our SEO efforts because it places less importance on our older posts by putting them a few pages deep. Your older posts should have a better chance of ranking higher than our recent posts because the search engines often like old web pages. For this, you want your 10 most recent posts to show on the home page, which is easily accomplished in the WordPress Administration Panel by going to Options and then Reading. Under Blog Pages you change the default number to 10. We want every post in a category to be shown on only one page. To accomplish this we used the Custom Query String Plugin from Andy Beard. It allows us to modify the number of posts displayed by the WordPress loop before it creates a new page. By setting the number to -1 we are able to show all posts on one page. We then removed the ‘Previous Post’ and ‘Next Post’ buttons from the archives.php and search.php files. This solution should help older posts to rank better in the search engines, because they aren’t buried multiple pages deep. Overall, these are 6 key parts of on-page SEO for WordPress Blog website: title tags, header tags, filenames, meta description and duplicate content. If you find it helpful, please share it with others online. Thanks!